Scouring boxes of papers for an indication of original order, picking out rusty staples, developing an appreciation for acid-free paper, trying not to walk into film crews, eating lunch in a pristine courtyard, and translating the disturbing reports of prisoners of war: these were just a few of the things I did as an intern at the Burke Library Archives earlier this year. This internship was my first foray into archival processing, and I admit I’m hooked. For someone wondering whether or not to intern at Burke, here are a few reasons why you should do it. First and foremost, Brigette, the Project Archivist and my internship supervisor, is an absolutely fantastic mentor. She has a unique way of combining flawless professionalism with warm guidance and encouragement. I was immediately impressed with how organized and prepared she was at my interview; never before had I had an interviewer answer so many of the questions I’d prepared before I even got to ask them. Brigette’s amazing guidance continued on my first day when she gave me a stack of background readings that constituted a crash course in the most essential knowledge to begin processing archival collections, including readings on both the nuts and bolts of processing and what it means to be an archivist on a more philosophical level. I’m drawn to both the hands-on work of processing and the greater calling of archivists to be activists and advocates of their profession in addition to being stewards of their collections, so I ate this up. The second reason you should intern at the Burke is that you get to work in a beautiful place. The professor for my Archives Management course this semester pointed out on the first day that archives are either housed in the basement or in the attic. In Burke’s case, we’re in the attic. I realized the first day during my tour that while the Union Theological Seminary is a gorgeous old building (hence the film crews using it for various TV shows), it is also gorgeous old building, and housing valuable historical primary materials under a potentially leaky roof is sometimes just part of the everyday pain and risk of being an archivist. I also admit, though, that the archives work environment is alluring to me. 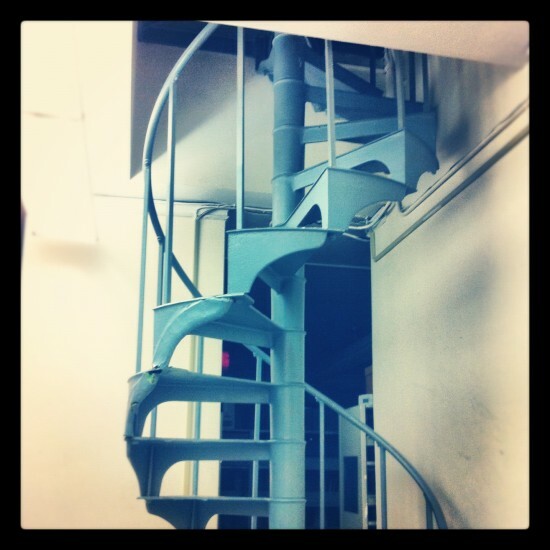 There was something about the inclusion of a spiral staircase and dusty work environment in the internship description that took me back to my undergraduate days of being a theater properties master, and it just somehow seemed fitting to get back into that kind of a workspace. During a tour of the Burke my first day, I was taken up that spiral staircase to see where the Missionary Research Library (MRL) and William Adams Brown Ecumenical Library (WAB) collections that I would be working with were housed, and again I was charmed. Last but not least, the experience you get working with Brigette at the Burke Library Archives is invaluable. After gaining firm grounding in the space and basic knowledge of archives processing, I was entrusted with processing a few small collections. Brigette’s guidance was absolutely essential to begin with, and I was grateful to have the feeling that I was able to ask any question at any time. I began to translate a collection of reports from German-speaking missionaries stationed in Cameroon who were taken as prisoners of war in 1914 when the English and French armies took control of the area – see the Finding Aid for more. These reports were fascinating (you can read about them in another blog post). I was very happy to have the chance to use my German language skills to contribute to the archives in a unique way. This again was thanks to Brigette, who was sensitive and creative enough as a supervisor to offer me projects that built on my existing skills. My most significant project at the Burke was processing the papers of John J. Banninga, a collection that was highlighted as particularly significant in the Henry Luce Foundation grant funding our work on the MRL and WAB collections. This collection includes a wealth of information on the efforts to unite Christian churches in South India, an initiative that took decades to realize and encompassed the greater part of Banninga’s career. The letters, reports, and clippings he kept reveal deep complexities and sometimes surprising disagreements that arose in the attempt to bring together churches that function largely autonomously elsewhere in the world. Both processing the actual papers and researching Banninga and the Church of South India gave me a peek into a discipline and an area of the world of which I have very limited knowledge. One of the reasons I decided to become an archivist/librarian is the opportunity to continually learn while simultaneously enabling future research. I can say there was no part of my internship at the Burke Library Archives that I did not enjoy. The best times were when my finished finding aids were approved, and when I was able to publish them online and see them come up in the Columbia University Library catalog. I learned a great deal about processing archives, and made a very small contribution to research. Perhaps most importantly, though, this internship was the beginning of what I think (and hope) will be a long and beautiful career. Lea was recently hired as a part-time processing archivist at the Center for Jewish History in New York City. This entry was posted in Student Entry and tagged Burke Archives, Burke Library, German, Imperialism, interns, MRL, prisoners of war, WAB, war on October 5, 2012 by Leanora Lange. Credit to: MRL1: German Missionaries in Cameroon Reports, The Burke Library Archives (Columbia University Libraries) at Union Theological Seminary, New York. One of the great benefits of interning at the Burke Library Archives last spring was the opportunity to fuse several of my skills in the various projects I undertook. One of these projects was translating the reports of German-speaking missionaries to Cameroon who were taken prisoner in the fall of 1914 when the English and French armies captured Cameroon’s capital, Douala, and the surrounding areas. These fascinating reports tell of injustices done to the missionaries while simultaneously revealing layers of racism, prejudice, nationalism, and self-righteousness festering just under the surface of their statements. Written just weeks after the missionaries’ return to their homes in Germany and Switzerland in early 1915, the sentiments are raw, the emotions strong, and the wounds still fresh. The thirteen reports are written as first-person chronological narratives of each missionary’s personal experience as a prisoner of war. All of the missionaries were members of the Basel Mission and most were stationed in Douala. Reading the reports one after the other is like watching a film of the same event made from thirteen different perspectives. From the individual voices, some harsher and some more reserved, an overall impression of the everyday injustices and terrors of war emerges. In almost every report, missionaries are stripped of their belongings, their homes ransacked and their gardens robbed and trampled. Conditions for sleeping and washing in the various make-shift prisons are disgusting, and the food almost inedible. All reports are written by men, most of whom also had wives whose experiences are only reported second-hand. Missionary Bührer writes: “Mrs. Gutekunst and my wife were held for hours by native soldiers who broke into and invaded our Akwa house after I left with random and repeated orders and counter orders until the six brute soldiers pilfered the property of Mrs. Gutekunst and finally left.” Exactly what Mrs. Gutekunst and Mrs. Bührer experienced in those hours remains, to a great extent, a mystery. The next morning, we were brought back to Ndunge, from which we began the journey to the coast together with my wife, child, and the other members and guests of the station. Other prisoners joined us at the nearby railroad station in Mambellion. The women, children, and luggage were loaded onto an open freight car. Since there were no functioning locomotives on hand and the car had no breaks, long ropes were tied to the back of the car, and they had blacks hold these so that the car would not take off too fast going down steep slopes. An imprisoned rail worker who knew the stretch very well and did not completely trust this set up offered to lead the transport. He was refused. It soon became clear that there were not enough men holding the ropes. The car started to run wildly. It could have easily come off the tracks at a sharp curve. Furthermore, both the women sitting on the speeding car and we men rushing after them knew that the bridge some 30 kilometers ahead had been blown up, and if the car were not stopped, it would fly out into the Dibombe River. In their desperation, the women began to jump off one after the other. Although the first to dare to jump—an injured black soldier who had been sitting on the car—fell under the wheels and was killed instantly, the women and children miraculously made it off the car with relatively few injuries. My wife, who together with our 2 &frac12; year-old was the last to jump down, had it the worst of anyone. She fell on her back and apparently landed on a rock, which left her in pain and almost unable to lie down for weeks. And the back of our child’s head hit her so hard on the mouth that several of her top teeth became loose and some fell out. We will never forget this ride of terror. Indeed, all of the missionaries’ journeys from working freely in Cameroon through the indignities of imprisonment and finally to their homes in Germany or Switzerland were rides of terror. Despite their often overt bias, these reports offer a view into the difficulties suffered by peaceful civilians during a time of war. Yet even among missionaries—those whom we might guess to be most modest in their needs, pious in their thoughts, and thankful to survive encroaching war—we find indignation, conceit, and hints of seething hatred. As documents of an historical moment and evidence of the cultural attitudes at the beginning of the First World War, this collection is a gem for historians, theologians, and pacifists, and of certain interest to many others. The German missionaries in Cameroon reports are available to registered readers for consultation by appointment only. Please contact archives staff by phone, fax or email at archives@uts.columbia.edu. 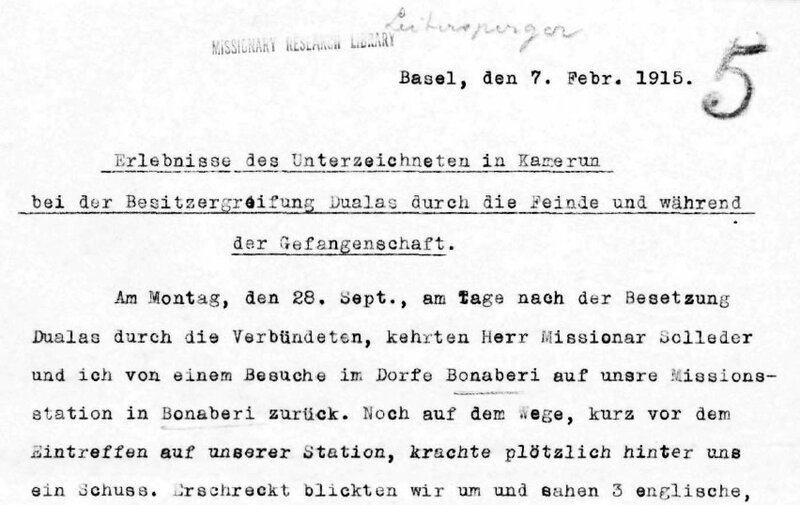 This entry was posted in Collections, Student Entry and tagged German, interns, Missionaries, MRL, prisoners of war, students, Swiss, translation, war on September 4, 2012 by Leanora Lange.